2. Department of Biotechnology, School of Life Science and Technology, Centre for Informational Biology, University of Electronic Science and Technology of China, Chengdu 610054, China. Custom-designed nucleases, including CRISPR-Cas9 and CRISPR-Cpf1, are widely used to realize the precise genome editing. The high-coverage, low-cost and quantifiability make high-throughput sequencing (NGS) to be an effective method to assess the efficiency of custom-designed nucleases. However, contrast to standardized transcriptome protocol, the NGS data lacks a user-friendly pipeline connecting different tools that can automatically calculate mutation, evaluate editing efficiency and realize in a more comprehensive dataset that can be visualized. 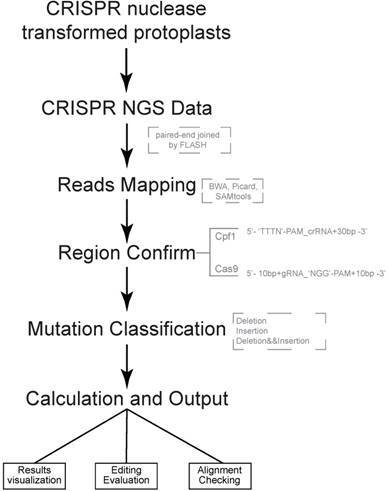 Here, we have developed an automatic stand-alone toolkit based on python script, namely CRISPRMatch, to process the high-throughput genome-editing data of CRISPR nuclease transformed protoplasts by integrating analysis steps like mapping reads and normalizing reads count, calculating mutation frequency (deletion and insertion), evaluating efficiency and accuracy of genome-editing, and visualizing the results (tables and figures). Both of CRISPR-Cas9 and CRISPR-Cpf1 nucleases are supported by CRISPRMatch toolkit and the integrated code has been released on GitHub (https://github.com/zhangtaolab/CRISPRMatch). Custom-designed nucleases can execute the targeted gene knock-out by creating mutations (insertion, deletion and replacement) at the double-strand DNA breaks (DSBs) site [1, 2]. Due to the efficient modification of target DNA, the nuclease tools such as Zinc finger proteins (ZNFs), transcription activator-like effector nucleases (TALENs) and clustered regularly interspaced short palindromic repeats (CRISPR) reagents were the popular genome-editing approaches in various organisms [3-6]. Compared with ZNFs and TALENs, CRISPR-associated protein (Cas) system (CRISPR-Cas) possesses better specificity in target locus by using RNA guided nucleases and owns advantages comprising target design optimization, super-efficiency and multiplexed gene editing at one time. As a revolutionary genome-editing tool [5, 8], CRISPR-Cas has been widely used in the genetic manipulation, such as disease treatment and crop breading. At present, CRISPR-Cas9 system with a canonical G-rich form 5'-NGG-3' of protospacer adjacent motif (PAM) and CRISPR-Cpf1 system with a T-rich PAM at the 5'-site of the protospacer are the major genome editing toolbox [9-11]. Due to the cost-effective, high-coverage and precise-quantification advantages, high-throughput sequencing method has been used for screening genome-editing results caused by CRISPR nuclease [12, 13], which leads to a dramatic increase in accumulation of edited genomic DNA high-throughput screens . In response, several bioinformatics tools became available to the next generation sequencing (NGS) CRISPR screening or analysis. 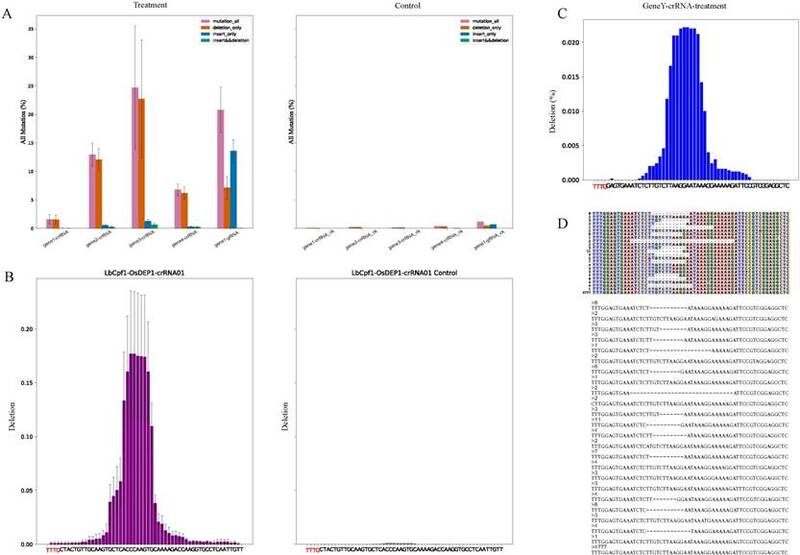 Notable among these are GenomeCRISPR , CRISPRcloud  and Cpf1-Database  which are web-platforms for visualization and analysis of the pooled screening data, and CRISPR-DAV , CRISPR-GA , CRISPResso , BATCH-GE  and Cas-analyzer  are as stand-alone softwares for CRISPR genome editing experiments analysis. However, limitations are existed among these tools. For example, web-platforms lack analysis of batch samples; NGS CRISPR-Cas9 and CRISPR-Cpf1 data cannot be processed and compared at one time; Efficiency of mutations and accuracy evaluation of genome-editing experiments are not summarized and well-visualized. In addition, NGS mutagenesis acquired by transformed protoplasts has become a fast method to evaluate genome-editing efficiency and accuracy. In previous works, Tang et al [13, 23] developed efficient CRISPR genome-editing systems in which constructs were transformed into plant protoplasts and mutagenesis were assessed by NGS technology conveniently. That strategy enables us to quickly evaluate the targeted mutation efficiency of DNA endonucleases. However, contrast to standardized transcriptome protocol [24, 25], the high-throughput edited genome sequencing data is difficult to calculate mutations and display results without an appropriate pipeline connecting different tools that can automatically calculate mutations and result in a more organized dataset which can be properly visualized. Here, we have developed an automatic stand-alone toolkit using python script, namely CRISPRMatch, a new platform integrating analysis steps like NGS reads mapping, reads count normalization, mutation frequency (deletion and insertion) calculation, genome-editing efficiency statistics at each position of target region, and results multiform expression. After installing a couple of independent packages, CRISPRMatch can analyze a series of CRISPR-Cas9 or CRISPR-Cpf1 NGS samples and compare the efficiency and accuracy of genome-editing endonucleases at one time. These packages including BWA (Burrows-Wheeler Aligner) , SAMtools  and Picard are applied for mapping reads and mutation calling). Pysam  is assisted in reads classification, indels detection and mutation calculation. Matplotlibs  is used for improved views of reads alignment mutation details at each position, and genome-editing efficiency statistics among target regions. We then validate CRISPRMatch's ability to perform both CRISPR-Cas9 and CRISPR-Cpf1 NGS samples by inputting some certain simple files. As expected, it automatically output a set of charts, figures and tables, on which we evaluate the benefits of using CRISPRMatch to result expression, detailed mutation visualization, genome-editing efficiency evaluation and checking. CRISPRMatch was designed to realize the strategy used in our previous Cpf1 work  by integrating analysis steps like mapping reads, calculating mutation frequency (deletion and insertion), evaluating accuracy and efficiency of genome-editing systems, and outputting (tables and figures) visualization. The NGS mutagenesis were accessed from transformed rice protoplasts, which enabled obtaining genome-editing data and testing mutation generation efficiency of different CRISPR editing systems quickly. Both of CRISPR-Cas9 and CRISPR-Cpf1 nucleases are supported by CRISPRMatch toolkit. The integrated pipeline, including data processing, analyzing and outputting are executed automatically (Fig 1). First, paired-end sequencing reads were preferred and must to be joined by FLASH (http://ccb.jhu.edu/software/FLASH/) to become single long reads. The joined reads were mapped to target editing region by applying BWA software with default parameters. Alignment files were sorted and made index by Picard and SAMtools. Second, genome-editing system types and target regions for mutation calculation were confirmed. Based on characteristics of each sequence-specific CRISPR system, we manually defined two cleavage regions of the endonucleases. For Cas9, the region (5'-3') covered 10 base pair upstream, guide RNA (gRNA) and 'NGG' PAM, protospacer adjacent motif (PAM), and 10 base pair downstream. For Cpf1, the region (5'-3') covered 'TTTN' PAM, CRISPR RNA (crRNA) and 30 base pair downstream. Third, different types of mutation, including deletion and insertion were detected by Pysam package in each mapped read. Here, a rule was set to define the mutation type of a read: the read was classified into deletion group when deletion type existed; when only insertion existed or insertion and replacement existed together, the read was classified into insertion group when insertion type existed; the read belonged to insertion and deletion group when both mutation types existed. Thus, the reads, which coming from genome-editing region, were divided into three type mutations for frequency calculation, including reads with deletion only, reads with insertion only, reads with both deletion and insertion (Fig. 2A). Considering the depth of NGS, mapped read count of each sample was normalized to one million and the mutation frequency stand for the number of reads with mutation per million. Last, summaries of mutation frequency and details of genome-editing efficiency in each position were plotted by matplotlib package. Pipeline of CRISPRMatch Several steps are involved, including building genome (target genes) index, deep sequencing reads mapping (Paired-end sequencing reads were joined to single long reads by FLASH), mutation detecting (three types: deletion, insertion, deletion and insertion), efficiency calculation and results export. Here, softwares like BWA, Picard and SAMtools were used for reads mapping. Two cleavage regions of the endonucleases were defined: For Cas9, the region (5'-3') covered 10 base pair upstream, guide RNA (gRNA) and 'NGG' PAM, protospacer adjacent motif (PAM), and 10 base pair downstream; For Cpf1, the region (5'-3') covered 'TTTN' PAM, CRISPR RNA (crRNA) and 30 base pair downstream. For analysis of results, reads alignment were presented by three formats for clear visualization. First one was to output all reads as fasta format, second one was to make the alignment result of each sample as a matrix and the last one was to plot the matrix with various colors which distinguished mutations directly (Fig. 2D-E). Users can watch a variety of genome-editing results in the target region by different approaches. For example, the fasta format file contained all kinds of genome-editing cases which showed nucleotide composition of each edited read (Fig. 2D), and the colorful matrix summarized mutations (Fig. 2E). Apart from showing alignment result, CRISPRMatch plot the deletion rate at each nucleotide base of each sample (Fig. 2C). Compared to the reference sequence, the positions of deleted bases were counted and frequencies were calculated by Pysam and stand-alone python script. As a result, the frequency plot of deletion (Fig. 2C) was consistent with reads alignment results (Fig. 2D-E). To evaluate the efficiency of genome-editing experiments, the genome-editing samples were compared with the control sample. Considering repetition of genome-editing samples, mean values of the treatments at each position were calculated. For clear visualization, deletion frequency comparison between samples with genome-editing experiment and control samples were displayed together (Fig. 2B). Significantly, differential deletion frequency between treatments and control was obvious and the effective editing region was consistent with previous results . CRISPRMatch realized an automatic pipeline for analyzing a list of high-throughput CRISPR genome-editing data. Compared to those existing CRISPR analysis tools, CRISPRMactch realized to process batch samples of CRISPR-Cas9 and CRISPR-Cpf1 at one time, detect efficiency of mutations and evaluate accuracy of genome-editing experiments, compare efficiencies of different genome-editing systems, summarize the results by figures and tables. In addition, CRISPRMatch was mainly developed for genome-editing data of CRISPR nuclease transformed protoplasts, which could evaluate the targeted mutation efficiency of DNA endonucleases and regions of guide RNAs quickly. Installation and usage of CRISPRMatch are user-friendly. In our solution, target region sequence, sample information and sequencing data are the only required files in this pipeline. Here, sample information must include sample name, location of PAM and gRNA/crRNA on the target region, relationships between repetition samples and control samples. All output files were text formats or pdf, which were suitable for checking and watching details of genome editing efficiency (examples on GitHub). Based on CRISPRMatch, mutation types including deletion and insertion are mainly detected. But, due to the complexity, replacement frequency just be calculated and provided as a reference value for nuclease efficiency assessing. Description of output files (A) The bar charts have summarized the all kinds of mutation between genome-editing data (Treatment) and control data (Control). The purple, orange, blue and green color bars stand for frequency of all mutations, reads with deletion only, reads with insertion only, reads with both deletion and insertion. (B) Summary of deletion among samples in a group. The bar charts display frequency of deletion between a genome-editing sample (LbCpf1-OsDEP1-crRNA01) and the control sample (LbCpf1-OsDEP1-crRNA01 Control). X-axis covers the genome-editing region and labels highlighted with red color are components of the PAM. (C) Deletion frequency of each sequencing sample (sample name” GeneY-crRNA-treatment”). X-axis covers the genome-editing region and labels highlighted with red color are components of the PAM. (D) Alignments result of partial reads (sample name” GeneY-crRNA-treatment”). The colorful matrix (top) distinguishes nuclear acid bases and deletions (marked by “-”) by different colors. Each line stands for the components of a read and the number on left is the count of all reads with the same arrangement. The fasta format (bottom) is another output style of alignment. The numbers stand for counts of the reads below. In conclusion, CRISPRMatch software realized the effective analysis of NGS genome-editing data from transformed protoplasts by CRISPR system and output mutation results automatically. NGS data of mutagenesis from organisms or individuals are supported as well. The integrated code was released on GitHub (https://github.com/zhangtaolab/CRISPRMatch). The simplicity and applicability of usage made this software suitable for genome engineering field. We hope CRISPRMatch will make a contribution to standard analysis pipeline construction of high-throughput genome-editing data. This work was supported by grants including Jiangsu Specially-Appointed Professor and the Project Funded by the Priority Academic Program Development of Jiangsu Higher Education Institutions (PAPD) to T.Z. and the Sichuan Youth Science and Technology Foundation (2017JQ0005), the National Science Foundation of China (31771486), and the Fundamental Research Funds for the Central Universities (ZYGX2016J119) to Y.Z. Y.Z. and T.Z. conceived the project and designed the pipeline. Z. Z. and Q.R. generated all the CRISPR nuclease constructs, performed the transient assays in rice protoplasts and prepared samples for NGS. T.Z. and Q.Y. integrated python code and independent packages. Q.Y., T.Z. and Y.Z. analyzed the NGS data. Q.Y., Y.Z. and T.Z. wrote the paper. All authors read and approved the final manuscript.